I understand why the designers of the Jaguar chose to use a chroma/luma based color format (smoother shading and easier logic design for the shader logic, etc -working only on 4 and 8-bit boundaries), but why did they choose a proprietary color model? And why use a luminance scheme that only shaded from normal intensity of colors down to black rather than having normal intensity in the middle with 128 shades towards black and 128 shades towards white? So better luminance shading than 15-bit RGB (a la PSX/Saturn) but weaker than CRY or 8-4-4 YCbCr, and weaker colored shading than 15-bit RGB but better than CRY (or YCbCr). Atari probably could of done better on a lot of things I'm sure but at least the Jag has an option like CRY and also has the option to do RGB. It has some of the coolest lighting, shading effects compared to its contemporaries. So we should be grateful for that, especially every time we play a game like DOOM on the Jag where the shading and lighting is so much cooler over the PSX and PC versions. I think time would probably be better served learning how to use CRY to the best of the jags abilities but fantasy threads are just that. Have fun! You write these threads just to bait me to answer, right? 1. All two hundred and fifty-six values should represent valid, and different, colours. 2. The colours should be well spread out across the colour space. 3. Colours should be able to be mixed by linearly averaging their colour values. 4. An intensity value of zero must be black. two x, y vectors was chosen. model is square when viewed along the intensity axis, it was necessary to come up with a new one. Standard color models like YIQ (r, theta) or YCbCr (no even distribution, violating #2) didn't meet their requirements. The Y in CRY had to be 8-bits, because Flare believed that smooth gouraud shading would be the key to the Jaguar's market dominance. This belief is reflected throughout the design of the Jaguar. Smooth polygon shading wasn't just a feature, it was THE feature -- it influences many major architectural decisions, including color space. 8-bits for Y leaves just 8-bits for color. CRY does a better job than standard color spaces of spreading those 256 values among useful colors, about as well as R4G4B4 does. Also, it allows color blending to work pretty well, again, about as well as R4G4B4 would. kskunk, we know the Jag just cant compete with the PS1 and Saturn when it come to texture mapped polygons, but how does it compare to them when it comes to gouraud shadded polygons?, since you mention it was the Jags strength in 3d, is it comparable to them?. For being the Jags strength, i have to say that i was quiet dissapointed with Battlemorphs graphics, it had a very short draw distance, albeit with a good frame rate. Its still a great game, and the G-shadded look is very cool (would love to see more games with that look), but again, for those sort of graphics to be the Jags strength, i expected a bit better. But hey, i guess its because it was jus a first gen JagCD game, right? kskunk, we know the Jag just cant compete with the PS1 and Saturn when it come to texture mapped polygons, but how does it compare to them when it comes to gouraud shadded polygons?, since you mention it was the Jags strength in 3d, is it comparable to them? It has a higher theoretical performance when plotting smooth shaded pixels than either the PS1 or Saturn. Although the Jaguar is quite good at plotting shaded pixels, it isn't as good at organizing those pixels into polygons. The more polygons there are, the more the Jaguar strains compared to the PS1. This is because the PS1 has fast dedicated hardware for transforming, lighting, and rasterizing polygons. In the Jaguar, these steps must be done with software. That leads into the other issue you raised: Realtime 3D programming for game consoles was a brand new field in 1993. While the PS1 did a lot of the work for the programmer, the Jaguar demanded the programmer use techniques that were sophisticated, difficult, and largely unheard of in the early 90s. It is amazing what programmers accomplished at the time. Since then, knowledge of 3D programming has become much more commonplace, and the techniques known only to the very best programmers are pretty well documented (if still hard to understand). I think the Jaguar could be pushed a little further with everything we know today. It's quite amazing what programmers accomplished on the Jaguar back then, given all the constraints -- low budgets, inexperienced coders, poor documentation, hardware bugs, and the newness of it all. Edited by kool kitty89, Sat Sep 24, 2011 1:44 AM. Cool topic BTW. Would love to learn how to work with and make CRY images for the Jaguar. Been interested in it ever since I looked into the components of thwe Jaguar Bubsy game. Funny doctorclu, the only time i have heard about CRY and Jag Bubsy together is when people are crying due to how bad it is...haha, just kidding. This would be a cool feature, but it's not obvious to me how to implement it. I don't want this thread to spiral out into a discussion of 3D lighting, but your approach seems to mix two unrelated kinds of blending: Additive and multiplicative. These are different effects used at different times. Multiplicative blending is for standard lighting, including gouraud shading. If you have a pure blue floor (say 0,0,150), no matter how brightly you light it, it saturates at pure blue (0,0,255), not white. Additive blending is for overlaying objects. If I want to place white fog over distant pixels, I might add white (150,150,150) to the blue floor (0,0,150) yielding a washed out whitish blue (150,150,255). Same trick is used with overlaying explosions, rain (subtraction), and other particle effects that are semi-transparent. In CRY, the blitter does your additive blending, and Y does your multiplicative. In the PS1, the blitter can do both. The PS1's approach uses a lot more hardware and is slower than the Jaguar at shading pixels, but it's more versatile. So, before we extend the range of Y, realize that this is only good for simulating VERY bright lighting conditions, not for fog, explosions, and other overlay effects. In other words, a lot of what we'll need to do is similar to the high dynamic range capabilities that appeared in 21st century consoles. The problem with extending the range of Y comes down to how gouraud shading and multiplicative lighting work. Y must have a linear relationship to perceived intensity, or shaded polygons will look blotchy and 'uneven'. CRY does this already. If I have red-purple (255,0,127) and I cut Y in half, I have half the perceived brightness and the exact same red-purple color (127,0,63). Now how can we maintain this while increasing the range of Y? First, let me try Y=2.0 with my red-purple. On my first try, I don't have red-purple anymore, I have pure purple (255,0,255). With Y = 1.0, or 255,0,127, intensity is 90.7. With Y = 2.0, or 255,0,255, intensity is 105.3. So to achieve the required intensity for smooth shading, the color we need to use is a very washed out white-purple, or 255,130,255, with intensity 181.625. I'd encourage you to create equations to do proper, saturating, smooth gouraud shading with Y > 1.0. However, the best I can come up with requires 9 multiplies and 9 additions. This is WAY more hardware than the 3 multiplies and 0 additions used in the Jaguar's CRY. I can't think of a good way to fit any of this into a look-up table smaller than thousands of entries, which wouldn't fit on the chip, either. Hardware isn't the worst part. To implement your proposal where Y=255 is white for all colors, while keeping Y linear for proper shading, Y=2.0 is not near enough. Let's say I start with blue and I want to light it with white hot sunlight. To get from (0,0,255) to (255,255,255), while keeping linearity in Y, requires Y = 8.7. Let's make it 8.0 for simplicity. We haven't just halved our number of colors, we've cut it by a factor of 8. 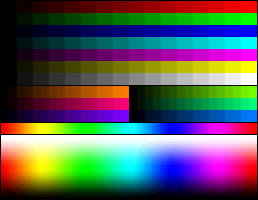 Now CRY has no advantage over 16-bit RGB, because the majority (>80%) of all colors are white. I know we end up here a lot, but the Flare engineers were very good. Their problem was they started with the wrong requirements, not that they left low hanging fruit behind! The other issue is with their comments on what colors the human eye is most sensitive to, especially their mention of red being most important when Green is universally considered to be the color of light the human eye is most sensitive to. I think you're misunderstanding what they meant. It is true that red contributes less to perceived intensity. But when intensity is provided by an 8-bit channel already, this is not about intensity. Rather, this is about how your eye differentiates subtle differences in color at the same intensity. From this perspective, which is the one that matters when choosing CR, it is correct that green is less important. Blue is actually most important. Humans are very good at differentiating shades of blue. Some people think this is related to outdoor depth perception, because distant objects turn very subtly blue due to atmospheric effects. Edited by kskunk, Sat Sep 24, 2011 1:48 PM. Sorry if i am a bit off topic here and if my questions are dumb for those with knowledge, but i have to know, is the Jag as fast at doing flat shaded polygons as it is doing gouraud shaded ones? I seem to recall someone mentioning a while ago that it is as fast at both, which made me wonder why Club Dive and Checkered Flag went the flat shaded route. Kinda has a Jaguar game look to it due to the gouraud shadding, huh. Again, i really like that graphic style and maybe if F1 World Tour had gone that direction, it would have run smoother. So does something like Drivers Edge look like its out of the Jaguars league? Edited by sd32, Sat Sep 24, 2011 6:11 PM. Flat shaded polygons are faster because they require less setup and could be twice as fast if they're done in 8-bit color mode instead of the 16-bit color mode used by gouraud shading. The programming is more complicated for gouraud shading, and that may be the main reason they went with flat shading. The Jaguar was pretty hard to program at a basic level. Really pushing the Jaguar required techniques that had just been invented and weren't too well known, and tools that Atari never bothered to provide. The big problem with 3D on the Jag is that the blitter can't draw a complete triangle in a single pass, unlike the PS1 (for example). You have to split each triangle (or polygon) into individual segments yourself, and "feed" them to it one by one, which is wasteful. Unfortunately, no, untextured gouraud shaded polygon engines fell out of favor with the advent of hardware acceleration, though even before that you had some totally texture-emphasized polygon games (ie Wing Commander III, IV, and Quake -prior to the accelerated version of the latter, and of course there's numerous later games that offered software renderer modes, and prior to acceleration you had some very texture heavy non-polygonal games like Doom and Duke 3D). There were actually a few earlier accelerators that didn't support texture mapping at all (or well) and did g-shading much better (I think some of the really early Matrox cards did that) but very few games took advantage of those. On PC, the most advanced fully untextured polygon based game I can think of is Tie Fighter, and that still only ran in 256 colors. Smooth shading was facilitated by use of an optimized palette (emphasis on shades over colors to some extent, and Star Wars ship models tending to be relatively gray-intensive anyway) and use of realtime dithering (one of the few non-accelerated games to do that). The game has a 640x480 high-detail option (320x200 is default) that makes the dithered shading much less grainy as well as reducing jaggies in general. The ideal example simply doesn't exist since texture mapping came in long before 24-bit rendering became common (since no others used custom colorspaces for smooth shading, it wasn't until 24-bit that you'd see stuff beating the Jaguar in that regard). It sounds like you're describing a dreamcast or late 90s high-end gaming PC class truecolor game without texture mapping. However, while no such examples of untextured games are really available, there is another area the Jaguar excelled at that was demonstrated in a handful of later gen games: flexible non-polygonal or mixed renderers using "pseudo 3D" techniques (mainly ray-casting based height maps, a la doom, duke 3D and the related -but very different looking- voxel terrain renderers like Commanche and Phase Zero). There's Amok on PC and Saturn (and a demo on the 32x recoded in the Scavenger demo tape) with rather coarse voxels (much less impressive than phase zero) as well as polygonal models, and there's also the Blade Runner adventure game on PC using voxels. The best example of a really flexible renderer came slightly later though, and that's with Outcast on PC. Shading/desaturating towards white also drops many more unique color/shade values than shading towards black in RGB (ie my suggestion of 128 shades towards white would have far fewer unique colors on the "white" side than the lower 128 shades towards black -with far more limited redundancy). OK, that makes more sense than the impression I'd gotten. However, from what I've seen, blue isn't easier to discern shades of (at least not pure blue from the RGB scale). Unless I'm some weird exception . . . or the RGB color tables I've looked at are off, or all the monitors I've been using are mis-calibrated. Plure blue is by far the hardest to discern shades of, then purple/magenta, and red is 3rd hardest to see of the 6 primary colors. Cyan seems the most obviously visible followed by green and yellow. Then again, you mentioned atmospheric effects and depth perception being prime reasons for human perception of blue, but "sky blue" is not very close to pure blue of RGB at all and is much closer to cyan (which showed very obvious contrast to me) though not quite right for that either. Edited by kool kitty89, Sun Sep 25, 2011 6:31 PM. This is still sort of on-topic because we're talking about how CRY works, right? Anyway, you're still focusing on "shades" which is intensity. That blue line you're looking at is a blue intensity chart. Intensity is not what they're talking about, CRY has plenty of resolution there. They're talking about color. It's hard to separate color from intensity when you look at RGB charts, because RGB doesn't have a concept of intensity. However, human vision does separate color from intensity, and this is a key part of understanding CRY and other color spaces. Look around the outer edge of the color wheel. These pixels all have similar intensities but different colors. Notice how the 'banding' or 'stair step' effect is stronger in the blue and red portions of the wheel, while the green part of the wheel looks 'smoother'. This is because your eyes are less sensitive to subtle changes in green-ness (again, not green intensity), but much more sensitive to changes in red-ness and blue-ness. As for the color of the sky, it probably depends on where your particular vision system evolved. Those of us living up in northern latitudes see a different color sky than our ancestors. To further complicate things, color perception is different from person to person, and the wavelengths detected by your 'blue cones' cover a lot of shades of blue green as well. Okay, okay, back to Jaguar talk please! Edited by kskunk, Sun Sep 25, 2011 7:46 PM. Its a shame that Strata didnt create more 3d games with Drivers Edge hardware, because as you can see in this video, http://www.gamesdbas...ivers-edge.aspx, i think it gives a good impression of what a late gen gouraud shadded racer would have looked like in the Jaguar. Yes, shades as in intensity/lumiance values of a single hue/color . . . that's what I thought you meant when you said: "Humans are very good at differentiating shades of blue." Doesn't RGB, by definition, have clearly defined intensities for the 6 primary colors (and black/white/gray)? Oh, you didn't mean differentiating different shades of blue (as in different luminance values of a single hue -pure blue in this case), but different "shades" as in different hues that are relatively near the blue end of the spectrum. Sorry, I nearly always see "shades" being used to describe brightness/intensity/luminance, not differing colors/hues. Also, are those colors really using identical (or as close as possible) intensity levels? Okay, okay, back to Jaguar talk please! I'm not saying games would have been Phase Zero quality, but expecting Commanche I level voxels in 1994 (maybe 1993 -would have been awesome for cybermorph) wasn't unreasonable for the time. I guess it could depend on your definition of intensity. But if you mean it in the "Y" sense as I do, no. Intensity doesn't have a standardized definition in RGB. Google "gamma correction in RGB" for the whole scoop. From epic, endless, discussions on other forums, I've learned that RGB is very poorly standardized, gamma is all over the map, different TVs, different video cards, and different video standards all result in different intensities, and of course - color is all a subjective thing in the human brain in the first place. Trying to be too concrete about this will just end in endless tedium. Anyway, back to the CR in CRY: I think they selected a pretty sensible 256 color palette for CR. But I agree with your other comments about how cool it would be to have a programmable CR palette instead of a hardcoded one. Unfortunately, RAM is at least 6 times bigger than ROM, and Tom was already way too big. So to add that feature, something else would have to give. You can't just move the programmable palette that already exists in Tom to the back end with the CRY multipliers -- if you did that, all the cool semi-transparent blending effects in the Object Processor would stop working with palette-based sprites. It's just tradeoff after tradeoff, and you can really get a feel for what Flare was going for by looking at all the tradeoffs they made. The main reason I don't get 4R4G4B4Y is that it seems to have nearly the same color expressiveness as CRY. That is, the main downside of CRY is that 4C4R makes big blocky color bands. But the color bands with 4R4G4B are just as blocky and chunky. Also, CRY does a pretty good job of maximizing unique colors and spreading them out evenly, where RGBY distributes colors less evenly -- try plotting them both if you want to see what I mean. With people already complaining about CRY being chunky, this wouldn't help. If you're more excited about RGBY because it allows additive effects to be more like they were on the Playstation, saturating toward white, it would get you this, but the tradeoffs seem kind of lousy. It would be less hardware to just due proper saturating on 15/16-bit RGB. Of course you wouldn't get that smooth CRY lighting trick, but if you're resorting to RGBY you probably didn't want that anyway! Edited by kskunk, Mon Sep 26, 2011 1:19 AM. Yes, making the 256x24 table programmable would have significant trade-offs. And the idea of a totally customized colorspace interpolated to 24-bit RGB, as already mentioned, would take far too much space even in ROM (192 kB to remap all 65k entries to 24-bit RGB). However, I wasn't suggesting programmable CRY hues in my previous post, but use of look-up tables to offer limited shading outside the normal CRY range. (similar to what can be done in software currently, but with hardware support) Except that has the same trade-offs with RAM as above, and using a ROM table would limit that more (and still use added chip space). Wouldn't 4-4-4-4 RGBY allow much more even color blending than CRY does? (ie using averaging of the 4, 4-bit channels compared to blending of CRY hues -without use of additional large look-up tables for blitter/GPU rendered stuff -more so for OPL object effects which can't practically use look-up blending) And on top of that, potentially allow for more than just 50/50 averaging for such translucency effects? It would take less hardware to support 15-bit RGB than it would for blitter shading effects in 4-4-4-4 RGBY? A more realistic route (and the one I was thinking of conceptually -but misspoke with the "bottom 4 bits" comment) would be to have Y/I define offests of 12-bit RGB within 24-bit RGB. (ie have 12-bit RGB able to be offset in 16 different levels to traverse the entire 24-bit range -ie I/Y set to zero would allow RGB elements to each go to 0-15, Y set to 1 would allow 16-31, etc) Thus you'd have 16 levels of intensity for the entirety of 12-bit RGB. You'd just have to be able to manipulate each of the 4 color/intensity elements independently (ie clamping at 4-bits for max/mimimum saturation, avoiding overflow/underflow and rollover errors). Alpha blending effects would involve averaging those 4-bit elements. You could also manipulate I/Y alone for coarser/more limited shading/lighting. And it's working purely on 4-bit boundaries. Hmm, actually, using 4-bits of "intensity" that did only control the lower 4-bits of all 3 8-8-8 RGB elements could be logically/mathemetically simpler to implement for shading than using 16 segments of 12-bit RGB . . . or if not simpler, able to avoid artifacts of the segment method that would appear without greater complexity to prevent them. For the segment method to shade smoothly, you'd want to modify all 3 RGB elements (add or subtract -for brighter/darker) until you couldn't shade any futher, then you'd switch to the next brighter/darker Y shade bank and start over with the original 12-bit color value, but that would lead to bands of desaturation (towards black/gray/white) at the fringes of each shade segment transition (more so for colors further from the 6 primary colors and gray) and to prevent that you'd need to set the intensity segment to change once any RGB element reaches 0 or 15 (depending on whether you're shading towards white or black), so you'd need logic to check for that. I wonder if the hack that Scatologic discovered for the Blitter improves performance in this area. Dunno, but even BattleSpehere's 3D stuff doesn't look good when compared to the PS1. We are aware its never going to be a 3d engine like the PSX but just wondering out loud if the 'Blitter Trick' improved the Jags lot at all in throwing polygons to the screen. BS/G never really throws around all that many polygons at once from what I've seen. I'm not sure it is doing anything particularly taxing or performing special or 'secret' tricks with the Jaguar hardware. I'm not basing that on any technical understanding of the hardware or the game, only the fact that it appears to run in Virtual Jaguar when other games (ones that are seen as being average or poor games, both technically and gameplay-wise) do not. Maybe that's not the best way to judge these things, but from using emulators of many systems in the past, it's usually the special-case games that abuse the hardware that are the last ones to be supported.